Normally, I don’t post two pieces on my blog in the same day, but I just received a box of these beauties from my blogging friend, Betsy, all the way from sunny California. So today I am making an exception. 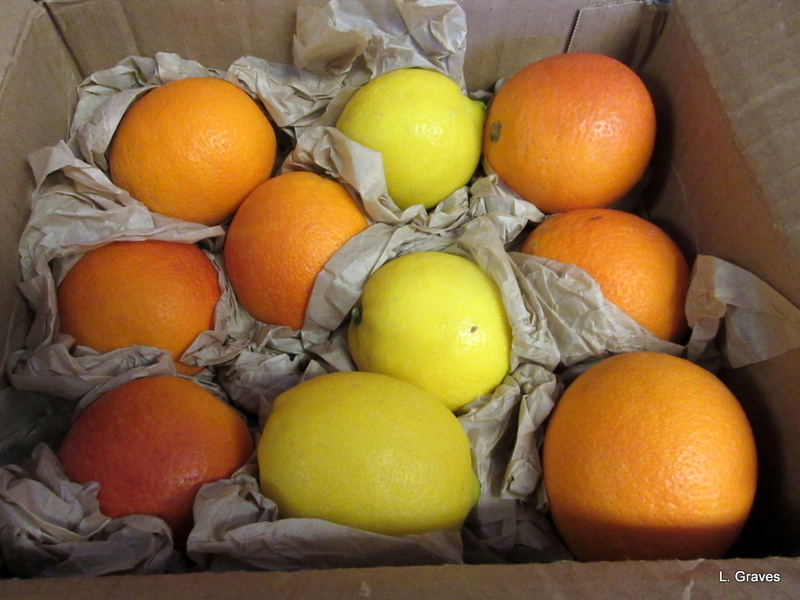 Holy cats, this gift of oranges and lemons made my day! Many, many thanks, Betsy, for your wonderful generosity. Oh, how beautiful they are. And to think they grew in Betsy’s own backyard. While I love living in Maine, I have to admit that I would be thrilled beyond description to actually be able to pick oranges in my backyard. Again, Betsy, thanks so much! Instead, I am going to celebrate this cold season of short days and twinkly lights, a time of year I love dearly. For various reasons, we no longer enjoy hosting big parties, but we do like inviting friends over for tea, coffee, and cookies or warm apple crisp, and that is what we are doing this December. Then there is the Christmas bustle of cooking, wrapping presents, and decorating. I don’t want to rush through the season. Instead, I want to savor each day, each activity. Christmas can be seen as a time of excess, and to some degree it is. But is also a time of generosity, a time of giving, a time of thinking about what someone else would like rather than what you would like. All to the good, as far as I’m concerned. Simply put, we can’t have too much generosity, a virtue that is often in very short supply, especially in this country. And here is the back. 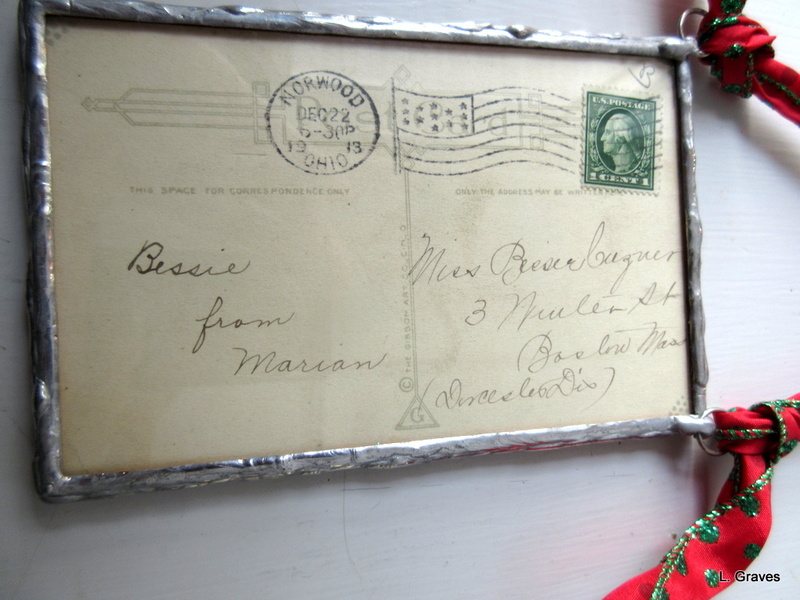 In 1913, Marian sent Bessie this card. Now how cool is that? Judy was flabbergasted as well she might be. How often does this happen? It has never happened to me, and I think it was a first for Judy. There was no explanation left with the server as to why the woman paid the bill, but I have a notion that the woman observed Judy and Paul and how loving, patient, and kind Judy is with Paul as she helps him cope with his disabilities. (Readers, Judy really is a wonder.) I expect the woman was moved and wanted to do something nice for them. This is all speculation, of course, but I think it’s a good guess. After lunch, as Judy was going home, she stopped at a light and noticed a woman standing nearby, with a sign asking for money. Judy noted how worn, tired, and discouraged the woman looked. Digging frantically in her pocketbook before the light changed, Judy found $20, about the same price as lunch, and handed it to the woman. The light changed, and Judy had to drive away. And that, dear readers, is a perfect circle of generosity, a lesson to keep not only for Christmas, but for the rest of the year as well. In the United States, today is Thanksgiving. Because we are taking a more honest look nowadays at exactly what happened in this country when the Pilgrims came over, the holiday has lost some of its luster. And rightly so. However, even though the scales might have fallen from our eyes, a day of gratitude where we celebrate the harvest with family and friends can only be a good thing. 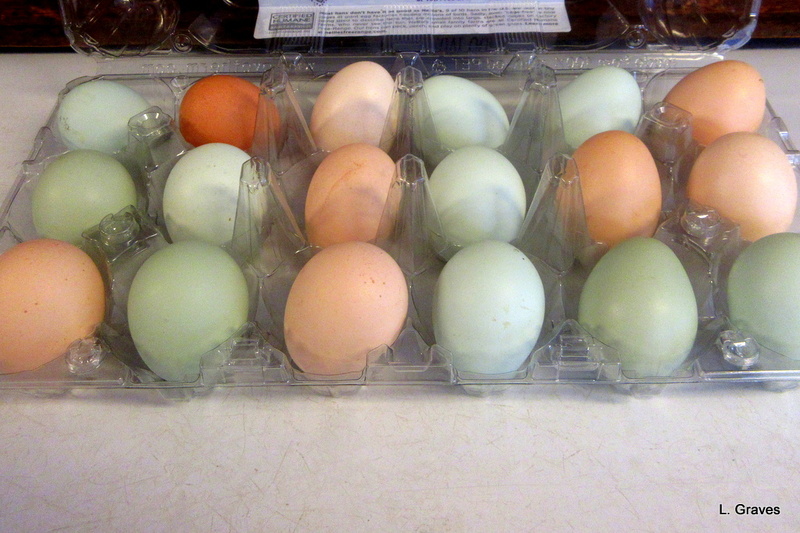 And speaking of gratitude…yesterday, our neighbor, a young woman, came over bearing these little gems from the hens she keeps in her backyard. What wonderful variety and color! I tried to pay her for the eggs, but she wouldn’t take any money. This brings us to another g word—generosity. When the two words—gratitude and generosity—are twined together, the world is definitely a better place. So on this holiday, I am grateful for the generosity of my neighbor, who gave me these eggs without expecting anything in return. And while I am on the subject of gratitude, I also want to express thanks for my many blogging friends near and far. You all make my world a brighter place, that’s for sure. Yesterday, the most delightful package came in the mail. 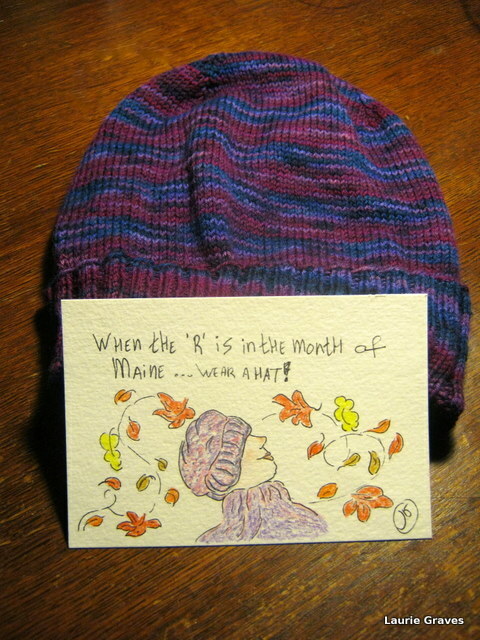 It was a hat, for me, knitted by Johanna of the blog Mrs. Walker’s Art and Illustrations. (I won it in a contest she sponsored on her blog.) Along with the hat came a charming note, drawn by the talented Johanna. I absolutely love the hat in every way. It has my favorite color—blue—along with other complementary colors. The hat fits beautifully, and it is ever so soft. I never thought I’d be writing these words, but I can’t wait until the weather is cool enough so that I can wear this lovely hat. The Internet, and blogs, can be a mixed bag, I know. However, for someone like me who turns her attention to the things she loves—gardening, food, writing about everyday life, art, books, nature, and photography—the Internet has been a source of great pleasure. I follow a number of blogs, which I am gradually adding to my blog roll on the Hinterland homepage. The blogs are written by people from all over this country and indeed from around the world—from England to Australia. Johanna’s hat is warm proof, if you’ll pardon the pun, of the generosity that is out there on the Internet. Now, I am a firm believer in generosity at home and in the community, but generosity can also ripple farther afield, and it makes the world a better place. So thank you, Johanna, for the wonderful hat. When I wear it, I will think of you and your generous spirit. 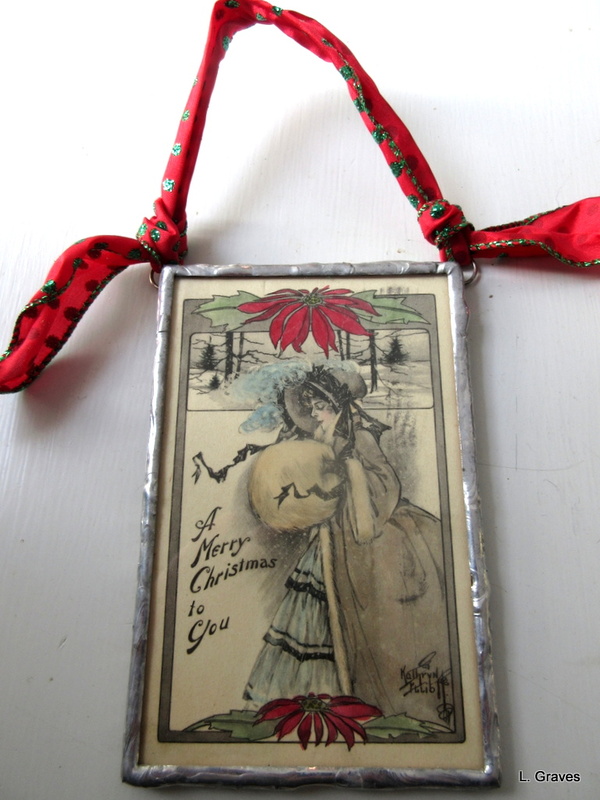 As for the card, well, that will be going in a special place, either in the kitchen or the dining room, for all to see. As we Franco-Americans might say, merci, merci!